Dead Man's Folly is a 1986 British-American made-for-television mystery film featuring Agatha Christie's Belgian detective Hercule Poirot. It is based on Christie's novel Dead Man's Folly. The film was directed by Clive Donner and starred Peter Ustinov as Poirot. The cast included Jean Stapleton, Jonathan Cecil, Constance Cummings and Nicollette Sheridan. It was shot largely on location at West Wycombe Park in Buckinghamshire, England. Hercule Poirot and his associate, Captain Hastings, are called in by his eccentric mystery author friend, Ariadne Oliver, to a manor house in Devon. Oliver is organizing a "Murder Hunt" game for a local fair to be held at Nass House, but she is troubled by something she cannot quite put her foot on. Things take a turn for the worse when during the "Murder Hunt" the girl playing the "dead" body is murdered for real. Soon afterwards, the lady of the manor mysteriously disappears and an old man's body is pulled from the river. Poirot must discover who and what are behind these seemingly unconnected events. 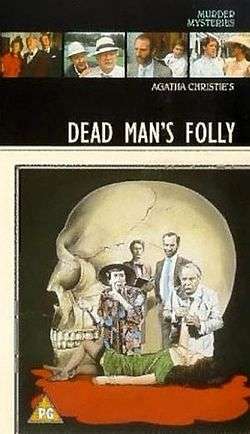 Wikimedia Commons has media related to Dead Man's Folly (1986 film).